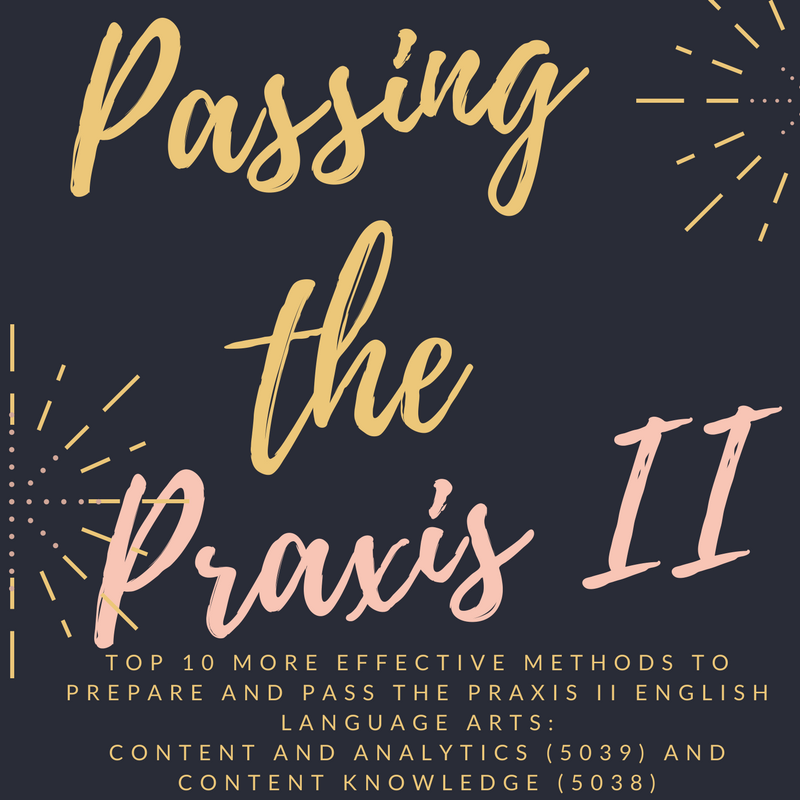 Many states require teacher candidates to pass the Praxis English Language Arts: Content and Analytics (5039) or Praxis English Language Arts: Content Knowledge (5038) in order to teach in a middle or high school classroom. Taking this teacher certification exam is an important step to beginning a rewarding career as an English educator. Before you know it, you will be preparing students of your own for their finals and cheering them to finish line! If you’re feeling anxious about taking the Praxis English Language Arts tests you’ve come to the right place. These rock solid free Praxis study tips add up to thousands of hours (and even years of experience) of Praxis English Language Arts experience and knowledge. Many test takers think that they need to spend their time rereading classic literature in order to pass the exam. However, rereading whole novels is not a good use of your study time! Memorize the titles of major works linked to famous authors from each time period. There is a wide range of knowledge that is tested on the Praxis English Language Arts tests. Teacher candidates often worry about how to study the various terms as well as major education ideas. Quizlet.com is one resource that is popular and effective in preparing for your English teacher certification test. This site has helped thousands of test takers pass-the-Praxis English Language Arts: Content and Analytics (5039) and Content Knowledge (5038). Even if you have to pass another Praxis test, for example, Praxis History, the site has a wide breadth of information and tools that can help. On this website, you can create your own set of digital flashcards. Tools such as “auto define” save you time by offering up a database of definitions. There is also an “image” feature which will allow you to add a related image to your flashcard. You can study your cards, have them sorted into known or unknown piles, and even play games with them. If you want to get started right away using Quizlet flashcards, try searching for already made stacks on the Praxis 5038 and 5039 tests. There is a variety to choose from! This last bullet point is very important if you want to improve your constructive response score. Readers want to see not only that you can make an argument, but that you can back it up with specific evidence. Be descriptive, thorough, and use details from the question in your answer. Once you have marked up the question, then you can eliminate your answer choices. Be sure to have read through all of the options before removing a choice. It’s also important to read the directions to see if you are expected to choose more than one answer. One common Praxis English practice mistake is to answer a question without having read all of the options. Sometimes an answer choice might be true but another choice might be a more complete and accurate answer. Find-Out: Will Real Praxis Test Questions Make You Tongue-Tied? Don’t be surprised if while taking the test you are asked to select more than one answer for a test question. This is a common type of question for the Praxis English 5038 and 5039 tests but surprises many test takers. Be sure to read the question carefully and to look for words in all-caps such as EXCEPT. Then, select your answers. Before submitting, go through each individual answer and hold it back up to the question. Does it really address what the question is getting at? Try not to overthink these questions and trust yourself and the knowledge that you have learned over the years. One of the best ways to study literary time periods is to look back at the introductions in literature textbooks. If you majored in English, you probably have a half dozen Norton Anthology of Literature books laying around. In fact, almost all literature textbooks contain these handy introductions. You can also find the information for literary time periods here. Many future educators come from fields outside of English or may be taking the Praxis English as a part of the requirements for organizations such as Teach for America. If this describes you, you might be worried about the preparing for the Praxis English 5038 and 5039 tests. The first step you should take while preparing for the Praxis English Language Arts exam is to review the official list of topics covered on the tests. You can find that information on the official website. Rank the topics by your comfort level and begin finding resources for those you feel least comfortable on. The internet has many free resources available including full length Praxis English practice tests, vocabulary flashcards and study guides. There are also test prep books and official practice tests that you can buy. Create a Praxis English study plan where you focus on different content each day. Avoid overwhelming yourself and switching up the content will keep your study time fresh and interesting. In order to pass the Praxis English tests, you’ll need to receive an official score at or above a certain number according to the state where you are obtaining a license. However, while studying you may come across the terms “raw score” and “unofficial score.” Understanding this terminology will help you to better understand your score on practice items and identify when you are ready to take the real test. The “raw score” refers to the correct number of answers you provided out of the total number of questions. This is good information in a general sense, but it is important to know that some questions are actually worth more than one point. In this case, the total possible number of points does not match the total number of questions. The “unofficial score” will appear on your test screen when you complete the test. This is a score between 100-200 and takes into account the numbers mentioned in the last paragraph. Often, this will eventually match your final score. However, it does not take into account constructed response scores because they cannot be graded instantly. After taking a Praxis English Language Arts practice test, use your knowledge of “raw” and “unofficial” scores to figure out where you are in the studying process. Regardless of the numbers you come up with, pay closer attention to the topics you need more practice with rather than a total number of points. 9.) Practice Makes Perfect: Are the ETS Practice Tests Worth the Money? Taking Praxis English practice tests is an important part of your studying process. But are they worth paying extra money for? When you sign up for your Praxis test, you will be given the option to pay for an additional practice test. Ultimately, this decision is up to you. If you have exhausted the information on the internet and in any test prep books you have it could be worth it. However, no amount of Praxis English practice exams will be able to tell you what questions will be on the final exam. 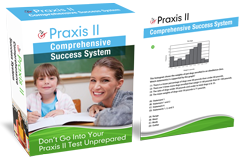 Ideally you will pass your Praxis English tests on the first try (they are expensive!). However, don’t be disappointed if you do not pass the first go through. There are many test takers who are also challenged by the Praxis and it does not mean you are not ready to become a teacher! The good news is that after going through the experience, you are more likely to do better on the second try simply because you understand what the entire process will feel like. After taking the test, you probably also have a good idea of what test items surprised or stumped you. Try making a list of these items and spending more time practicing. If you still do not feel prepared, you might consider reaching out to a tutor who specializes in the exam. They may be able to work with you one-on-one to review your practice tests and practice important skills. 1. Which of the following is an example of an informative essay? The correct answer choice is D because there is no language present that hints to an argument or position made by the author. 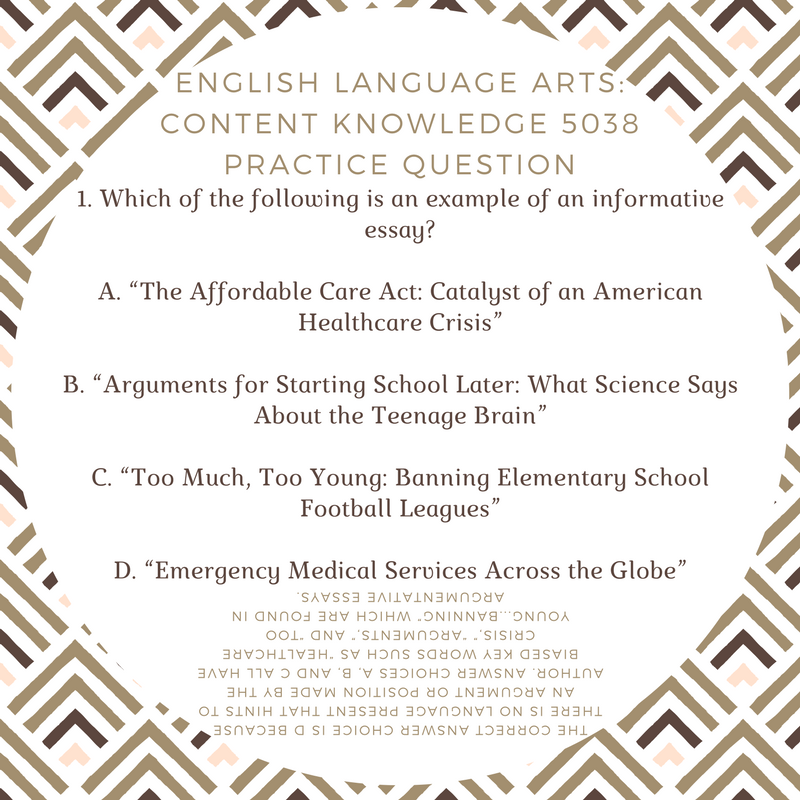 Answer choices A, B, and C all have biased key words such as “healthcare crisis,” “arguments,” and “too young…banning” which are found in argumentative essays. 1. Which of the following strategies would help a struggling student follow a teacher’s lesson during direct instruction? The correct answer choice is D because answers A, B, and C are all correct. Any and all of these strategies can be used to assist a struggling student. Want more Praxis English Language Arts: Content and Analytics (5039) and Praxis English Language Arts: Content Knowledge (5038) test prep tips?